We know quite a lot about the location of the birthplace of the human race. Even in Victorian times, when the great apes, the chimpanzee and gorilla were first discovered in equatorial Africa, some researchers speculated that this too was the birthplace of mankind. Over the intervening years, fossil evidence came to light that reinforced this theory. Much more dramatically, in the last few years evidence has come from a totally new direction, DNA analysis. 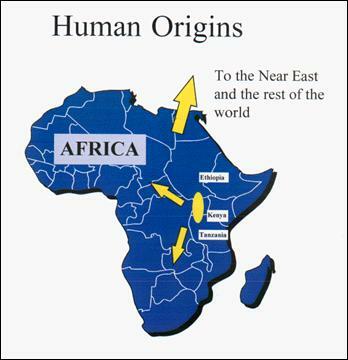 It is now clear that everyone on this planet is descended from a group of ancestors that lived in the savannahs of East Africa some 80,000 years ago. It even appears that we are all descended from just one woman who lived in the group 100,000 to 150,000 years earlier, the so-called ‘Eve’ hypothesis. There was not necessarily anything special about her. It’s just that the blood-lines of all the other women of the tribe have petered out down the generations. At that time the total world population of humans was probably no more than about 10,000. And how were they living? We can now get a good idea from a number of areas of research. For example, by studying such features as teeth and jaws, we know that they were designed for a particular kind of eating pattern. There are even studies of enamel thickness, tooth wear, micro-scratches and striations that can be matched with known patterns today. There are studies of the vegetation that grew in the area at the time, and of the animal life that abounded then. Calculations are made as to the most efficient use of energy expenditure to gain food. (It is assumed that, back then, our ancestors were no more inclined to work than we are today.) For example hunting is a high energy expenditure with an uncertain reward. It is also risky. Rather than getting dinner, the hunter could finish up as dinner. Foraging for nuts, fruits, tubers, roots, flowers, edible gums, shellfish, caterpillars, was much surer, safer and energy efficient. The forensic archaeologists can tell a lot from both human and animal bones. Early humans were tall: Turkana boy, only about 12 years old, would have grown to 6 feet. We can tell a lot about the diseases they suffered and didn’t suffer. For example, osteoporosis, gallstones, kidney stones, arthritis and dental caries (cavities) were virtually unknown. It is possible to tell something from the animal bones that are found at ancient human encampments. Were these animals killed by humans? If so, were they killed for food? Or were these animals killed by some other predator and only then butchered by humans? Or was the animal killed by a leopard and dragged to the same leafy spot occupied by humans 20 years previously? Mostly it is impossible to know from a pile of animal bones, accumulating over millennia, who ate them, let alone what proportion of the diet they represent. After all, bones fossilize very well, vegetation doesn’t fossilize at all. Nevertheless clever analysis can cast some light on what really happened. For example, prey bones often bear scratch marks. Some of them are from the teeth of the predator that killed them, some are the marks of a stone tool. Sometimes they occur together. It is possible to discern which came first, the lion’s tooth-marks, or the stone knife. The studies to date suggest that humans mostly chopped the meat after a predator had first killed it. This is not surprising. Back then there were no real weapons, not even bows and arrows. All that Pleistocene humans had were sharp sticks, sharp stones and their bare hands. The savvy strategy to procure meat would be to fight off the hyenas and vultures for the carcass of an animal brought down by a specialist killer, such as a lion. If humans were eating meat, how important a part did it play in their diet? And what was it like? There is still a vigorous debate over the first question. There were times of plenty and times of food stress. What is very clear is that humans were eating animal matter in significant quantities – say 20% of their diet. But notice the words ‘animal matter’. A large part of their consumption would have been made up of lizards, snakes, bugs, caterpillars, frogs, insects, shellfish, eggs, and, yes, small game and carrion. it was very low fat – no more than 3% (as against 25% fat in modern beef). the fat was very low in saturated fat and high in ‘essential fatty acids’ (exactly the opposite of modern supermarket meats). the essential fatty acids were present in a well defined ratio of linoleic acid to alpha linolenic acid. The range of this ratio varied within close limits of between 4:1 and 1:1. It transpires that this fatty acid profile is exactly the profile that we modern humans need too. In the average western diet this ratio is totally distorted at 32:1, and we know that this has harmful health effects. More of this in Chapter Five, How and What we Eat. But let’s look a little more at these essential fatty acids. They are so important that they used to be called vitamin F1 (linoleic acid) and vitamin F2 (alpha linolenic acid). All the other fatty acids that human biochemistry needs can be made by the body from these two. But why these two fatty acids in particular? The body never had to learn how to make them. They were always there in the diet. They were in the plants that the herbivores ate, so they were there in the herbivores that the carnivores ate, and ultimately they became part of the carnivores too. Those fatty acids were omnipresent in the whole nutritional environment – and in that ideal ratio range of between 4:1 and 1:1 to boot! A similar phenomenon is found with vitamin C. Humans, along with most other primates, are the only creatures that cannot make vitamin C in their bodies. This is not a fault, it’s just that our bodies never had to learn to make it. Vitamin C was always present in the diet from the fruits and vegetation. The body’s need for these three vitamins (C, F1 & F2) alone tells us a lot about our Pleistocene ancestors’ eating patterns. A hunter-gatherer needs a range of about 5 square. miles to feed himself. The maximum population that the continental United States could support like that is 600,000 hunter-gatherers. Compare this to the current US population of some 260 million. How exactly did our ancestors, live all those generations ago? We are now able to piece together a clear picture. They lived in groups of 35 to 50 people – men, women and children together. This group would have a territory of 200 to 300 square miles that they defended fiercely from incursions by neighbouring groups. Within this territory they wandered. These people had no clothes and no possessions. According to the availability of the food supply they camped and then moved on – every day if need be. They had no permanent shelter. Each night they would hunker down under a bush and maybe pull some branches over into a make-shift shelter. They had fire and used it for light, warmth, cooking meat, and for firing the bush to chase out small animals. These people didn’t plant, didn’t conserve, didn’t save but they did make a mess wherever they went! They didn’t wash, smelled like pole-cats and lived in relative squalor. And yet they were healthy and had good longevity. They had few predators and were much more likely to be killed by warfare with neighboring groups. It has been estimated that their percentage casualties per year were as much as those of the German population during World War II. It is thought that much of the time, our early hominid ancestors fulfilled their basic protein needs just by consuming plant foods. These peoples had a choice of hundreds of edible plants, a rich variety compared to the 30 or so found in today’s supermarkets. The adjacent table itemises some important nutrients found in a basket of just 50 forager plant foods. Yes, protein is in vegetables too! 82g of protein are plenty for the average adult. Better still, it is absorbed in small doses throughout the day. Not a sudden, calcium depleting, kidney-bashing, amino-acid rush as happens when a large steak is eaten. Indeed, on average, Americans consume twice the amount of protein thought advisable. Not only is there plenty of protein, there is plenty of calcium, yet not a glass of milk in sight. Sodium is good and low. After all, they had no added salt and no processed foods. Sodium intrinsic to the plant, was the only sodium in the diet. More interesting is the ratio of potassium to sodium – about 40:1. The potassium/sodium ratio is important to keep electrolytes balanced at the level of cell metabolism. Get it wrong, and the heart stops beating, nerves stop functioning and muscles shut down. Get this ratio wrong in the diet, and the body particularly the kidneys, is battling to straighten it out. Today’s Western diet reverses the desirable ratio. It is now known that this chronic imbalance in the potassium/sodium ratio is a factor in many cardio-vascular diseases, such as stroke, high blood-pressure, cardiac arrest and inelastic arteries. Note that our ancestor’s high potassium intakes came from vegetation. And the low sodium levels from the absence of table salt. As for vitamin C, see what a high level it is – 540mg. There is ample evidence that the official R.N.I. (Recommended Nutritional Intake) of 60g is far too low. It is good enough to prevent scurvy, yes, but not good enough for optimum health. So here is another sign-post, our Pleistocene ancestors were in the habit of consuming some five times the quantity of vitamin C habitually consumed by Americans. We can be sure that, if vitamin C is constantly in the food supply, the human body will come to depend on it. Today we fall far short of supplying that need. Fiber content at 62 g is some five times the norm for Americans. We can be sure that our Pleistocene ancestors never suffered from constipation, colon cancer or diverticulosis. Also note the quality of the fiber is not a rough, indigestible, cereal bran, it is all from fruit and vegetables high in heart-healthy soluble fiber. That’s another straw in the wind – humans are designed for a high consumption of soluble fibre, not cereal fibre. A word about tubers and potatoes. A large percentage of our ancestors’ food supply came from vegetation that was prised out of the ground (with a digging stick) that is, roots, tubers, corms, bulbs etc. A little known, but common characteristic of all these foods is that they were all low glycemic. The tubers had very little starch (instead they had low glycemic inulin). The potato is a novelty in the human diet. It is high in starch and is strongly glycemic and insulinemic1, both harmful properties. Regrettably the potato, although botanically a tuber, cannot be classed with the plant foods to which humans are naturally adapted. Finally, note the quantity of plant food consumed is some 2kg (4 ½ lb.). This is the volume of food that we are designed to eat. Today, we eat less volume, but much higher calorie-dense foods. This is another major reversal in our naturally adapted eating pattern. We can be sure that there are health consequences. Thus for hundreds of millennia the pattern remained the same. The climate didn’t change, the food supply didn’t change, and our bodies didn’t change. The eating patterns remained sensibly the same: fruits, nuts, berries, roots, vegetation and, yes, the occasional egg, insect, grub and small game animal. This process went on down the millennia in a slow rhythm in which the evolution of Man was sensibly in harmony with his slowly changing environment. His biochemistry was in equilibrium with the fuel furnished by his foraging . Like every other creature, he fed from what was naturally available. His body was naturally adapted to his food supply. The main characteristics of this food supply were high volume, low calorie density, low fat, high in nutrients and micro-nutrients – and it was low glycemic index (more of that later). These ancestors of ours were very successful. They multiplied and spread out over the whole of Africa. By 50,000 years ago they were crossing the land bridges into Asia, Europe, Australia and finally the Americas. By about 15,000 years ago the world was filled up. They were still wandering foragers needing 200 to 300 square miles per group. We can imagine the scene – still multiplying, groups becoming too large and needing to split up, but having nowhere to go except fight another group for its territory. Some groups found themselves in the most inhospitable and unlikely ecological niches, like the circumpolar Eskimos of the Arctic, and the Touareg of the pitiless Sahara desert. Others, like the Polynesians, undertook ever more daring voyages to uninhabited islands. But inexorably, the world filled up and there was nowhere else to go. Then one year, about 10,000 years ago, in a corner of what is now the border of Turkey and Iraq, something extraordinary happened. A small band of these early foragers took control of their food supply. They stopped wandering and they planted. It meant staying in one place, protecting the crop, and inventing fences, hoes, drills, baskets and pots. It meant devising methods of processing, conserving and storing the crop. Finally, it meant inventing cooking. With these big changes coming such a short time ago in evolutionary terms, our bodies have not at all adapted to them. Taking control of their food supply solved at a stroke the problems of overpopulation. Instead of 200 square miles, this group needed only 2 square miles to feed themselves. They had become farmers. This allowed much greater densities of population, and the growth of villages, towns, and cities. But there was a price to pay, as we shall see. Finally, over 6,000 years ago these peoples entered the eras of the great civilisations of Sumer, Egypt and Babylon. And that is where the history books begin. This ‘farming revolution’ spread, during several thousand years, to almost every corner of the globe. That is to say that most peoples, all over the world, took control of their food supply, wherever they happened to be. And, in taking control what happened? They cultivated not the crops that they were used to eating, but the crops that it was possible to cultivate. They favoured the crops that were easy to grow, protect, harvest, and store. That is, crops that were convenient and practicable. As time went by, they also domesticated wild animals. Instead of the wide range of animal matter consumed before – caterpillars, locusts, ants, lizards, snakes and small game -- they bred and raised a much smaller variety of very different animals, the cattle, sheep, pigs and fowl of today. These animals were chosen only because no other creature could be domesticated. For the first time man started eating two kinds of new food: carbo­hydrates with high glycemic index, and meats high in saturated fat. In addition, some tribes, the Mongolian nomads and Aryan pastoralists in particular, introduced dairy products. For the first time too, man started cooking in a big way. As the societies became richer, they could afford to be more frivolous. They cultivated crops and raised domesticated animals that were tasty, prestigious, and amusing. Such is the progress of this trend that, today we eat foodstuffs almost exclusively because they are convenient, tasty, cheap and attractive. We have lost all touch with the eating patterns for which our bodies were designed. Today, we have lost touch with the eating patterns for which our bodies were designed. soft vegetation, fruit, nuts, insects, flowers, gums, carrion, some egg and some small game. seeds, grains or cereals, dairy products, farm meat, saturated fat or vegetable oils. That is a synopsis of what we understand about our pre-historic ancestors. This information can be compared to what we know about peoples that still lived in the same way in recent memory. The great European explorations and expansion of the last few centuries put an end to the few extant forager lifestyles. . Acculturation by contact with the West changed these primitive peoples’ way of life forever. Nevertheless, it has been possible to piece together historical accounts for some of the early contacts. For example, until 200 years ago, the Australian Aborigine still lived the foraging life-style. This applied to the whole continent – the size of the U.S. – which stretched from the cold temperate regions of Tasmania to the tropics of Queensland and the Northern Territories. It is estimated that even though the continent was filled to saturation, there were no more than 800,000 aborigines. The first European colonists of Australia were English convicts sentenced to “transportation.” Some of them escaped from captivity and lived wild with the Aboriginals. Later, their experiences were recorded by researchers. Other evidence comes from the first pioneers and missionaries to the ‘outback’. They observed the aboriginals as they pushed back the frontier. Later researchers have worked with semi-traditional Aborigines to download their remembrances of times past. All these accounts are helpful and point in the same direction. However, we must also recognise that these accounts were gathered under unscientific conditions and that as such, they have to be treated with more caution. Similar remarks apply to other pre-farming peoples such as the Eskimo the Plains Indian. Attempts have been made in recent years to study so-called hunter-gatherer tribes like the Ache of Paraguay and the Bushmen of Southern Africa. ‘So-called’, because they have been influenced by proximity to the modern world, and they inhabit marginal ecological niches untypical of our hunter-gatherer forebears. Even so, useful and indicative data are obtained by researching them. There is not the space to discuss these data here, but there are several useful references in the bibliography. The Australian Aborigine was the archetypal Pleistocene-type forager (or in common parlance ‘hunter-gatherer’). His lifestyle has been closely studied. He was wise enough to never adopt agriculture, although he knew about the techniques from visiting Asian fishermen. The Australians lived in small groups of about 35 to 50 souls who wandered their territories of 200 to 350 square miles. Traditional Aborigines had no clothes and no dwellings. Every night they pulled together a rough shelter out of branches. They carried with them virtually nothing. Everything was improvised for the occasion. Their few possessions were multifunctional and portable. Spears, woomeras and boomerangs for the men. Digging sticks and grind-stones for the women. Always, the band carried a “firestick,” a flaming brand to set the campfire at night and fire the bush on occasion to trap animals. They were quite careless about this. Sometimes whole regions went up in smoke, simply to force out a small animal 50 feet away. Some of the healthiest and long-lived communities in the world are tribes that live simply, often in difficult circumstances. The Hounzas, for example, have excited interest ever since a young British Raj Army medical doctor, Robert McCarrison, had charge of them in a remote valley in the High Himalayas. They led a frugal life, cultivating root and vegetable crops and some apricot trees. Meat and dairy products formed only 1.5% of their diet. McCarrison was astonished to find that the Hounzas suffered from no chronic diseases, that they had vigorous, muscular bodies to an advanced age, and degenerative diseases were unknown. They kept their teeth intact for life; that they had an extraordinary resistance to infections; the men were still procreating at the age of 75, and apparently lived to 100 years old. That was in 1904. McCarrison was so impressed that he monitored these people for another 14 years before returning to London. He found it difficult to believe, but after eliminating all other possibilities, reluctantly came to the conclusion that diet was the determining factor. He became a prestigious research scientist and was one of the first nutritionists to make himself unpopular by suggesting that white bread, sugar, meat and dairy products were at the origin of the average Londoner’s comparative bad health. The early settlers imagined, falsely, that the aboriginal life was incredibly hard. But even in the Great Central Desert, the aboriginal had a wide variety of plant and animal foods. This was demonstrated most spectacularly and tragically by the fate of the exploring party of Burke and Wills. Having traversed the continent from south to north with a huge baggage train, they finally ran out of food and pack animals in the deserts of the return leg. They tried to live off the land as the aboriginals did – but without their detailed knowledge, they grew weaker. Wandering groups of Aborigines came across them and gave them some help, showing them how to pound seeds into a cake called “nardoo” for example. The explorers ate lots of it, but became ever weaker. They ate no vegetation – they just couldn’t find any tomatoes, lettuce or onions! The explorers were dying not from starvation but from malnutrition. They developed scurvy, and other deficiency diseases. Burke and Wills died, but a third member of the party, King, was luckier. He was found by a group of aborigines and he went to live with them. This time, he ate the full range of foods available to the aborigine – none of which was a ‘proper’ food in European eyes. King survived until rescued by a search party two months later. All the evidence suggests that, just as for the Great Desert Aboriginal, our Pleistocene ancestors in East Africa could survive with a great deal of security in even the most hostile environments. There were plenty of fall-back positions. If certain favored foods were not available, then there were always others. And anyway, it was always possible to move on to another place where there would be yet another range of potential foods. It is now believed that famine was an extremely rare occurrence amongst hunter-gatherers, they just had too many options. Famine is a phenomenon that came with the farming revolution. One single crop failure could wipe out a whole people. All their eggs, as ours are today, were in too few baskets. What about the children? Infants were breast-fed ‘on demand’ until the age of at least three years and sometimes four. Solids were only introduced when the child had teeth to masticate properly. In the absence of processed foods and formula milk, it could only be that way. Weaning was started with suitably easy foods like the soft fatty meat from the tail of a goanna. The aborigine’s feeding pattern changed day to day and season to season. Sometimes their diet was high in vegetation with fruits such as ‘bush raisins’, ‘bush tomatoes’, ‘quandong’, ‘bush plum’, ‘mulga apple’, ‘bloodwood apple’, ‘wild orange’, ‘red apple’, ‘cheesefruit’ , ‘bush fig’; and vegetation such as water lilies, cycad, palm shoots, pandanas nut, gall nut, , truffles, bush yams and innumerable edible leaves and roots. The Aborigine, like most hunter-gatherers, exploited sources of food that are not available to other primates – roots and tubers. There was little competition from other mammals for these foodstuffs and, in hard times, they often provided the bulk of the diet. Indeed the women’s digging stick has been called the aborigine’s most important survival implement. Most of the plant foods were eaten raw, although some would be baked in the ashes of the fire. At other times, animal matter was important: witchety grubs, locusts, lizards, snakes, goannas, magpie geese, eggs and, in coastal areas, turtles, shellfish and file snakes. Sometimes there was a major kill of a kangaroo, emu, wallaby or, in coastal areas, barramundi, catfish, saratoga and dugong. This was a time of feasting when up to 25 pounds would be consumed at a sitting. Mostly, animal matter was eaten cooked. Small game, snakes, lizards, grubs and bugs would be cooked whole in the embers of the fire. Larger animals would be eviscerated and the offal baked and eaten separately. Animal would be either baked whole or baked dissected. Meat was eaten ‘rare’. In times of scarcity, the millstone was pressed into service. The tedious business started of collecting grass seeds, winnowing, threshing, pounding and grinding. It was so labour intensive that the aboriginal did it only in times of dire need. In common with other cereals, the resulting flour had to be cooked to make it digestible. No pots or pans, just mix the flour with some water, form it into a patty and bake it in the embers of the camp fire. Those Aborigines who ate this way too much, had worn and pitted teeth. The aboriginal had a sweet tooth. A disproportionate amount of his time went in the searching of ‘sweetmeats’. Honey ants (ants gorged with the nectar of flowers) were a favourite. In addition there was lerp (sweet insect secretion on eucalyptus leaves), blossoms and gums. If he was really lucky he would find a nest of honey bees to smoke out. But these were rare occasions and the amounts were small. The traditional aboriginal was very lean but healthy. His Body Mass Index was 13.5 to 19. Compare this to the official US figure for healthy B.M.I. of 20 to 25. The Western target for body leanness is still relatively plump. The Aboriginal blood pressure, cholesterol and triglycerides were low. He had good (high) serum levels of haemoglobin, vitamin B12, vitamin C and folate. Atherosclerosis was rare. Diabetes was unknown. All this came to an abrupt end when the European colonists arrived some 200 years ago. Very quickly the aboriginal became ‘acculturated’. Flour, sugar and rice were distributed to the aboriginals by well meaning mission stations. Sugar was eagerly sought. Consumption rose to 12 pounds per head per week. Soon, tinned meat, tinned fruit, biscuits, confectionery and jam joined the list - to say nothing of alcohol and tobacco. What has happened to the Aboriginal’s health? He now has very high rates of: obesity, atherosclerosis, diabetes, dental caries, and ischemic heart disease. His life expectancy has dropped to 20 years fewer than his Caucasian counterparts. Trials have been made where Aboriginals suffering from these degenerative diseases were returned to traditional life patterns. Almost miraculously, within the space of weeks, their health returned. The aboriginal has traded his calorie-poor, nutrient-dense diet for exactly the opposite: a calorie-dense, nutrient-poor diet. And he did this with alacrity. It is a lesson for all of us that our instincts in matters of nutrition cannot be trusted. Our instincts in matters of nutrition cannot be trusted! A similar fate awaited many other peoples when they came into contact with the western dietary habits. In the United States, the Native Americans suffer in a similar way. Rates of obesity, diabetes and cardiovascular disease are much higher in this population. The much studied Pima Indians of Arizona have one of the highest rates of these diseases in the land. Trials with Navajo Indians have shown that when they return to traditional tribal patterns of eating, all their health indicators return to normal. Blood pressure, diabetes, obesity are all controlled. 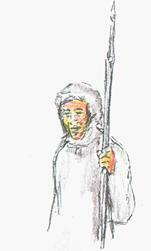 The Eskimo is an example of a race which lives in the most extreme of unpropitious environments. With virtually no vegetation and winter temperatures dropping to below -40°F, he lived out the greater part of his life eating fish, seal and whale. In spite of that, he had low blood pressure and low rates of heart disease. He got his vitamins from eating the skin of the seal and the stomach contents (lichens and mosses) of the caribou. He ate every part of the animal – brains, intestines, blood, even the faeces. Almost always it was eaten raw. Living above the tree line, a campfire was a rare luxury. He cut off the blubber from his kill (seals, whales etc.) for use as lighting oil and other external uses. Seal and whale meat shares similar characteristics with our ancestral wild game. There is little fat in the muscle meat (little ‘marbling’), and it is particularly rich in essential fatty acids. As if that were not enough, the Eskimo high fish diet gave him eicosapentanoic acid - a great heart protector. In fact it was perhaps too much of a good thing. Typically Eskimo bleeding time was high and they suffered from difficult-to-stop nosebleeds. The Eskimo diet is very high in animal protein, calcium and Omega 3 fats. The high animal protein provoked accelerated ageing and osteoporosis. The Omega 3 oils in the flesh however, protected him from cardio-vascular disease. The Eskimo is an example of a race which lived successfully enough with very little in the way of fruit and vegetable in the diet. Nevertheless, his life expectancy was low - around 50 years. The Eskimo died of accelerated ageing. Today, with westernisation, the Eskimo has suffered the same fate as the other hunter-gatherers. He suffers from obesity, heart disease, diabetes and high mortality. Life expectancy has dropped even lower, to around 35 years. soft vegetation, fruit, nuts, insects, flowers, gums, some egg, some seafood and some game. seeds, grains or cereals, sugars, dairy products, farm meat, saturated fat or vegetable oils, salt. Forensic archaeology is the science of detecting and deducing from archaeological remains. For example, skeletons and their habitat are analysed for various periods in human history. Forensic archaeologists can deduce a surprising amount from these remains. The Dwarfing of the Human Race. One clear and easy result is the comparison of skeletons today and in pre-farming times. Our Pleistocene ancestors had an average height some 6 inches greater than their descendants who took up farming. Today, in the opulent but still malnourished West, we have recovered only about 4 inches of the deficit. Maybe this comes as a surprise to hear this. We do not realize how much our impression of past standards of living is highly conditioned by our image of life in the Victorian cities of the industrial revolution. Dickens and Hugo did such a good job in drawing attention to the wretched conditions that, even today, those images linger in our subconscious. We have made huge progress since the nadir reached in the times of Dickens, but we are still a way from regaining the healthy lifestyle conditions enjoyed by our pre-farming Pleistocene ancestors. The only reason stopping us, in these times of plenty, are our own poor feeding choices. The reality is that farming radically changed our ancestors’ eating patterns for the worse. The responsibility is now within our own grasp to make wise feeding choices. The whole of recorded history is a story of the struggles of populations for ‘living room’. There was always more population than land to support them. This did drive the incredible progress in extracting more and more food from the same land. But there was always a time lag. Furthermore, under these pressures, humans were spreading into lands and climates for which they were not at all adapted. It is a great tribute to their ingenuity that farmers scratched a living in Northern Europe. But scratching was all it was. Our ancestors over the past couple of thousand years were in general malnourished - much more than their ancestors of 10,000 years earlier. Our recent ancestors were malnourished compared to our Pleistocene forebears. Fruits – apple, carob, christ’s thorn, egyptian plum, fig, grape, hegelig, juniper, olive, argun palm, date palm, persea, pomegranate, sycamore fig, water-melon and many more. Vegetables – garlic, onion, radish, turnip, bulbs, agrostis, celery, cress, leek, lettuce, purslane, goats beard, saffron, water chestnut, cucumber, okra, gourd, and many more. Legumes – beans, chick pea, lentil, lupine, pea and vetch. Animal Matter -- ox, sheep, boar, heron, Nile perch and many more. Analysis of the skeletons of those who took up farming, shows that they must have done it under considerable duress. It was that,, or die of famine. Their skeletons show signs of osteo-arthritis, carpal tunnel syndrome, and collapsed vertebrae. Why was this? It was due to the drudgery of grinding grains, from morning till night, between two slabs of stone. And, in view of the bone deformities that they suffered, even the youngest children were pressed into service. In pre-historic times no one lived on grains from choice. In pre-historic times no one lived on grains from choice! We have extensive evidence from early Sumerian and Egyptian sites over 4,000 years ago. It is quite remarkable that the Ancient Egyptians have left us a legacy of sumptuous burial tombs (the pyramids) with inscriptions of their daily life. As a bonus they left the embalmed mummies, accompanied by daily artifacts, for us to analyse. Even the ordinary folk, who were simply buried in the sand outside the cities, have been preserved by the dryness of the environment. We therefore know quite a lot about their state of health too. Typically populations, as they developed farming, gradually developed degenerative diseases. The wealthy Pharaohs of Egypt, gorged themselves on bread, honeyed cakes, ox, game, fowl, fruits, figs, dates, wine and beer. Not surprisingly, they suffered from obesity, atherosclerosis, diabetes, and gallstones. We know that the ordinary people, who typically ate vegetables, rough whole bread, olive oil and figs, were on the whole lean and healthy. However, all classes suffered from gum disease and dental cavities and abscesses. This is put down to the high consumption of bread. All classes suffered worn and pitted teeth from the high grit content of the flour. All classes suffered too from parasites such as guinea worm and river blindness. The Egyptian civilisation was particularly vulnerable, being built upon the Nile and its regular floods. As techniques ‘improved’ for making bread lighter, and the taste for whiter bread became popular, so dental cavities (ca) makes its first appearance. Dental caries was virtually unknown in the times before the invention of bread. On the other hand there is a notable absence of diseases such as syphilis, cancer, tuberculosis and rickets. This gives us pause for thought. How is it that not one of the tens of thousands of mummies examined shows signs of cancer? The answer will come later in the book, but we can be sure that the predominant reason is that some aspect of the ancient Egyptian diet was protective. Fruit, vegetables, salads, nuts, some fish are helpful. Farm meat, saturated fat, dairy products, vegetable oils, refined cereals, sugars, are harmful. Mankind has shown immense adaptability and ingenuity as he has spread out all over the globe. He has had to live under conditions to which he is not at all adapted. It is like a vast laboratory where a multitude of different experiments are going on simultaneously. We can analyse the different lifestyles and compare them to the health consequences that result. In the last few decades, the eating habits of whole populations have been studied. Links have been sought between these habits and the measured incidence of various diseases and illnesses. Chinese men have a higher life expectancy than Americans - even though in China the means of keeping old people alive for many years simply don’t exist. The Japanese have, with the Hong Kongers, just about the longest life expectancies in the world. It is statistics like this that give epidemiologists plenty to ponder. It is extremely low fat. Japanese men have a life expectancy 4 years greater than Amer­cans. But only on condition that they stay in Japan. When Japanese migrate to America and adopt the American ‘way of life’ including its diet, their life expectancy drops to the American norm and they get the same diseases. At home, by a fluke of culture, geography and good luck, they have hit on a good eating pattern. (see box). But even so, it is not perfect. For example, the Japanese high consumption of salt (in soy sauce) gives them a high rate of death from stroke. The Japanese traditionally consume rice as a staple. Rice is ‘empty calories’ having a low micro-nutrient and low protein content. Rice’s glycemic index, however, is better than Western staples (wheat and corn) and falls in the ‘Borderline’ category. The Japanese regard rice as being a low quality ‘filler’ (which it is) and feel bad about serving up large quantities of it. Unknowingly this cultural pressure is health-helpful as is its substitution by plant food where possible. Traditionally, the Japanese are Buddhists, and as such they do not eat meat. However, they do eat fish. So by chance, they discard a harmful foodstuff and pick on a helpful one. Even so, they do make one mistake, they often eat the fish raw. As a result, the Japanese suffer significantly from various intestinal worms and parasites. Rapeseed (colza) has been cultivated for millennia in the far East and the Japanese have been using colza oil as their chief source of fat for at least 2000 years. Again, by coincidence, they have adopted a ‘good’ oil. Even soy bean oil, also present for some time in their cuisine, is less bad than most of the alternatives that we use in the West. Thus the Japanese have a good diet and it protects them from a widespread bad habit – smoking. Nevertheless, there are things they could do even better – like reduce salt consumption and reduce the consumption of soy products. Similar observations have been made with the peoples of the Mediterranean northern rim. The Cretans, (whose statistics boost the Greek life expectancies in the graph) had one of the highest life expectancies in the world, in spite of a hard lifestyle. This so-called ‘Cretan’ or ‘Mediterranean diet’ has gained a lot of currency - and rightly so. Its consumption profile is much closer to the ideal for human beings. Note that this so-called Mediterranean diet contains no spaghetti, pizza or medallions de veau. Coincidentally, the Cretans use an oil (olive) that is neutral in its health impact. Less well known is their high consumption of purslane. This is a plant that used to be well known both in Europe and in North America. What is so special about it? It has a remarkably high alpha-linolenic acid content. The full significance of this is explained in Chapter Five. Again, by chance, the Cretans have hit upon a plant food that supplies the essential fatty acid, vitamin F2 (alpha-linolenic acid) in which the average Westerner suffers a deficiency disease. Sadly, with the advance of prosperity and the crumbling of old traditions, both the Japanese and the Cretans are adopting Western eating habits. The deterioration in their health is now being documented. are all much lower than in the Northern peoples of Europe and of the Americas. milk, cream, butter, vegetable oil - none. They drink: wine in moderate quantities. A group of 606 heart attack patients living in Lyon, France, was divided into a control group and an experimental group. The control group carried on eating as before a diet typical of Western industrial societies. more green vegetables, more root vegetables, more fish, less meat (replace beef, pork and lamb with poultry), no day without fruit, and replace butter and cream with a special margarine made from canola oil. All other fats were replaced by olive oil and/or canola oil. Moderate wine consumption was allowed. After 27 months the death rate of the experimental group was so dramatically lower than the control group, that the experiment was stopped early so that the control group could benefit from this knowledge. All this is to do with the Cretan or ‘Mediterranean’ diet. It is a way of eating which is demonstrably heart healthy. Yet there are other organs and diseases to consider and, as we shall see later, there are some significant improve­ments that are still to be made. Doesn’t this seem familiar?. And isn’t it extraordinary that there is no disease that can be imputed to a high plant food diet? 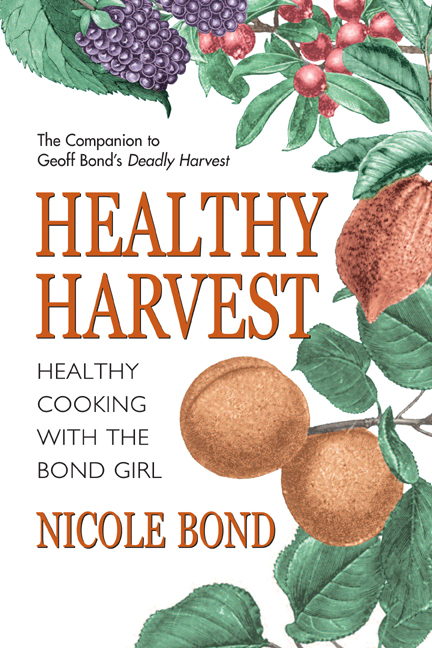 The full impact of these helpful/harmful foodstuffs on health is documented in Chapter Eight, The Food/Disease Connection. Another helpful tack is to look at creatures who are built to similar body plans to ours. These creatures are the class known as primates, the great apes, being the most like us. From DNA analysis we now know that we share over 98.0% of our genes with both the chimpanzee, and the gorilla. Our basic anatomies and biochemistry are almost identical. 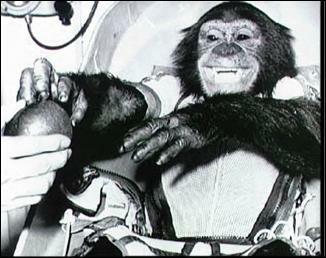 Astronaut Chimpanzee ‘Ham’ grabs a fruit. He looks pleased to return to Earth after his Mercury space-flight. Ham was pioneering for Alan Shepherd. For these reasons researchers, after they have first tested mice and guinea pigs, try a new drug on a chimpanzee for a final check. If it works on him, and is harmless to him, then that is the nearest proof possible that it will be fine for humans too. It is by studying the great apes, that we can learn a lot about how human bodies work, too. The great apes live in tropical rain forests and eat what they find there. Tropical rain forests don’t have marked seasons. Vegetation can be flowering, fruiting, seeding and re­gen­erat­ing at any time of the year. Nevertheless, there is a rhythm of drier and rainier seasons which mean that there are times of plenty and times of food stress. The great apes have a very wide territory and they roam around it like nomads foraging for food. Every night they make a nest in the trees out of branches bent and broken into place. Great apes are messy creatures leaving excreta and debris as they go. Being forest nomads, they have never had to develop a sense of neat housekeeping. We know that chimpanzees have similar social struct­ures to us. They have family quarrels, power struggles, intrigues, alliances, deviousness - and loyalty and devotion. From studies in the wild we know how they eat. They live in tropical African forests and they are still largely tree dwelling. Chimpanzees eat what they find in trees. That is to say fruit (mostly), vegetation, flowers, gums, nuts and berries. They will opportunistically eat all kinds of things if they come across them: birds’ eggs, grubs, termites and other bugs. The Chimpanzee is a curious creature, ready to try most things, but also quite fussy. He will inspect his food carefully, removing any offending part before consuming it. Chimpanzees will occasionally even hunt small mammals such as infant monkeys. They hunt as a team, corner the monkey and then, between them, kill the monkey by tearing it limb from limb. Unlike true carnivores, chimpanzees don’t have (as humans don’t have), naturally endowed killing weapons such as needle sharp teeth or razor claws. These hunting expeditions are rare occurrences and had never been observed until the 1960’s. They happen at a precise season of the year and seem to be linked to male power struggles and the seduction of females. At such times, the percentage of meat rises to 30 - 40 % of the diet. There are other periods of the year when no meat is consumed at all. Averaged over the year, it has been estimated that 90% of a chimpanzee’s diet is vegetable matter, with a high emphasis on fruit. Chimpanzees range widely to obtain their food, particularly up and down mountain-sides, to get a variety of vegetation from the different altitude zones. They go out of their way to do this, as though they know that their nutrients are not to be found in just one spot. For comparison purposes, the quantities are scaled down for a 160 pounds human. Even so it represents ten pounds of food intake per day. Humans are not gorillas and it is not suggested here that we should slavishly model our eating patterns on them. All the same, humans can and do eat like that and vegans can draw inspiration from this vegan feeding pattern. They should replace much of that pasta, bread, potato and cereals by high micro­nutrient density plant food. The gorilla is a total vegetarian. Although an adult male weighs 400 pounds. of solid bone and muscle, he lives entirely on the fruits and vegetation found in the tropical rain forest. A gorilla will not eat bird’s eggs should they be right next to him. The gorilla gets all his nutrients from what he eats, chiefly vegetation, what we would call leafy green vegetables and salads. His diet also includes nuts, flowers, mature leaves, twigs, and gums. Protein comes entirely from the vegetation; energy from the carbohydrates in the fruit and vegetation; vitamins and minerals (including calcium and iron) are all present in perfectly healthy quantities. Look at the table above. It is the food typically consumed in a day by a gorilla in captivity. This particular menu has been chosen because it contains only foods that humans eat too. That gives a direct comparison for what a human might consume on such a typical day. In practise, over a period of time, a gorilla will be eating even in a zoo a huge range of plant foods including gums, flowers, branches and twigs. In the wild, the gorilla would not be eating raisins, sweet potatoes, or corn. The zoo-keeper clearly has not heard of the Natural Eating Pattern. In mitigation, note that these non-primate foods form only a small proportion of the total intake. The gorilla ranges less widely than the chimpanzee. He is less fussy and is more of a slow-moving vegetation processor. With all that food he has got to eat, he just keeps stuffing down whatever is closest to hand! weighs 400 lb. of solid bone and muscle! The chief characteristic of the great ape diet is that it is high in volume low in calorie density, rich in micro-nutrients; high in fiber and very low in fat. There are no: cereals, dairy products, bulk fats or oils, fish, or starches. There is virtually no meat. Sounds familiar? The great apes spend quite a lot of time eating, up to 30% of their waking time, even more for the gorilla. Their eating pattern is to start foraging in late morning and then ‘graze’ at regular intervals. That is to say, they eat little but often. But it is worth repeating, they are snacking on low calorie-density foods. If proof is needed, they hardly ever drink. The water content of their foodstuffs is greater than 80%. At this level the great ape can maintain a positive water balance without consuming water. What does this mean in practical terms? After all, our ancestors walked barefoot. They also never washed and lived in what seems to us great squalor. Are we expected to return to that? Of course not. The whole point about Natural Eating is that we learn the lessons. Lessons about the genetic programming that determines the harmonious eating pattern for our bodies. We can identify those aspects that are important and those which we can steer around. In other words we can prioritise. And just because a food is new to the diet, doesn’t mean that it is condemned out of hand. It just has to prove itself before it can be admitted to the club. For example, legumes, tomatoes, cocoa and even alcohol (under carefully controlled circumstances) get their ‘Green Cards’. The job of the next part of this book is to illustrate how this can be done. How we can get closer to our naturally adapted eating patterns while living in the modern world. Natural Eating is the art, under modern conditions, of getting close to our naturally adapted eating patterns. A hooked wooden stick used for launching a spear with greater force than can obtained by the arm alone. In the early days of European colonisation of Australia, many exploring expeditions were mounted. One of the most celebrated, and most tragic is the expedition of Burke and Wills, sponsored by the Royal Society of Victoria. Burke left Melbourne with a party of 18 in August 1860 to explore the continent of Australia from Melbourne in the South to the Gulf of Carpentaria in the North. Impatiently, about half way up, he decided to leave 12 members behind at a base camp at Barcoo Creek, and continue with just three others, Wills his deputy, Gray, and King. Gray had already died ‘of exhaustion’ earlier in the return leg. Compare this amateurish bungling to the superb organisation, professionalism and sensitive bush skills of the Lewis and Clark exploration of the American North West. A large Australian monitor lizard.